We interrupt Theme Week to bring you this exciting message: We've been frequenting the website Wonderly lately, and we've fallen in love with it. From their website, “Wonderly is a place for innovative, female creators and audiences to meet, collaborate, and celebrate each other’s creations.” Umm, that's perfect and right up our alley. More about Wonderly here. 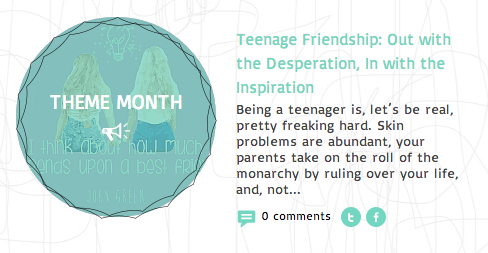 On a whim, we decided to submit a blog centered around the September theme, Friendship. And our blog was accepted and featured today! We are beaming with pride and excitement. You guys, this website/community is so awesome. We are humbled to be included on it and will definitely be participating each month :) Go check it out and submit something! Click the photo above to be taken to our post on Wonderly for September. Being a teenager is, let’s be real, pretty freaking hard. Skin problems are abundant, your parents take on the role of the monarchy by ruling over your life, and, not to mention, cute-person-with-the-smile-that-said-hi-to-you-once is now dating someone else. However, being a teenager certainly isn’t all doom and gloom. It’s a time where you get to be whoever you want to be and hang out with whomever you want to hang out with. Having a good teenage experience is strongly, if not solely, dependent on your friend group. 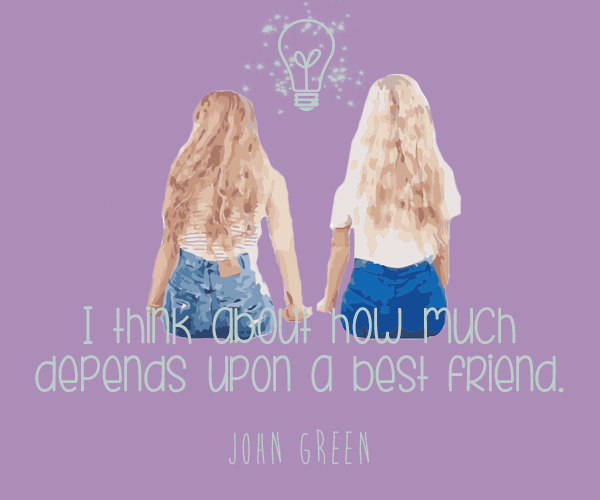 As young adult author John Green once wrote, “I think about how much depends upon a best friend.” The answer? Everything. If we knew then what we know now about friendship, high school would have been a lot easier. →Always surround yourself with inspirational people. “Inspirational” people might mean a different thing for every person. Our definition is people who recognize your talents and push you to your full potential. Nothing is dimmer than never being inspired by someone else. Don’t allow yourself to always be surrounded by people who never want you to become more. You deserve friends who care enough about you to help you achieve everything that you might not even know that you can do. And try to be that same kind of friend back. →Friendship is a two-way street…or, to be more punny, a two-way ocean. A true friend never just takes, takes, takes while you give, give, give. If you’re in a relationship like that, get out. You deserve better. You deserve more. →If you can be weird in front of another person, unexplainably weird, weird to the point where you might even be weirding your own self out, that person is an awesome friend. The fact that you feel that comfortable in front of another person is remarkable. Don’t forget that feeling. →Sometimes friends just fall out of your life. Guess what? It’s okay. Never take a friend fall-out personally; it will just create more drama than is actually there. More often than not, life catches up to us, and it’s almost impossible to keep in touch with everyone we care about. Sometimes life gets in the way of friendships, but don’t let that ruin your memory of that friendship. Albeit hard, being a teenager is wonderful. And it’s even more wonderful if you’re surrounded with the right people. This list is a great device for teens and a great reminder for non-teens. If we knew these things when we were 15, some of our friend choices probably would have changed. Surround yourself with ardent people who encourage your hobbies, engage in your quirkiness and enjoy your company.